While some may argue that the Audi S8 is maybe too formal by design, no one can deny its status as a luxurious and powerful sedan. And although it is fighting a tough market, the 520 horsepower and 481 pound-feet of torque that lie under the hood make a very compelling case. To some more demanding owners and potential customers that’s not enough power. But with no versions above the S8, they either have to choose a different body and go with the RS7 — rated at 560 horsepower — or take it to ABT Sportsline, the No. 1 specialist when it comes to Audi-badged vehicles, for a little extra something. 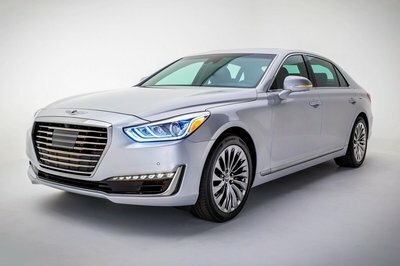 Based on the facelifted S8, the company’s latest product comes to fill the gap with a sedan that has all the luxurious standard features fitted from the factory and a hefty power increase on top. 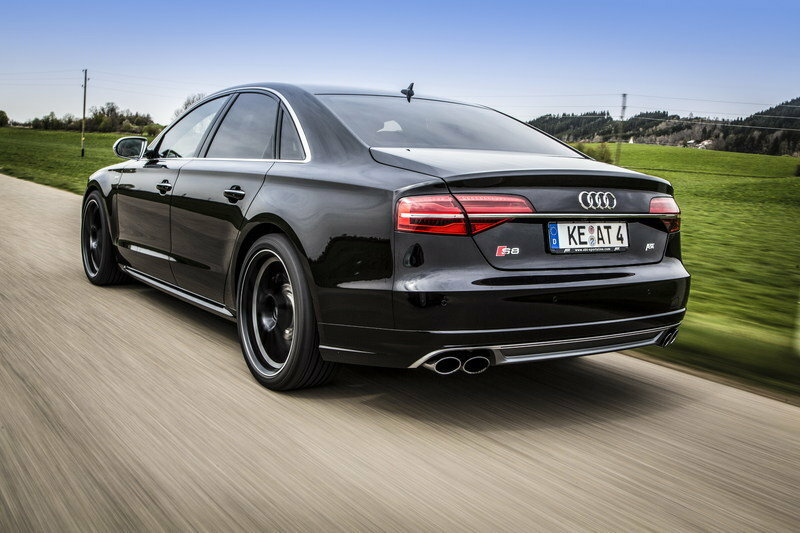 With more than 600 horsepower and tap, the S8 by ABT Sportsline has its very own combination of exterior paint and wheels, but, as with most of the tuner’s products, customers are allowed to add numerous extras before taking delivery. 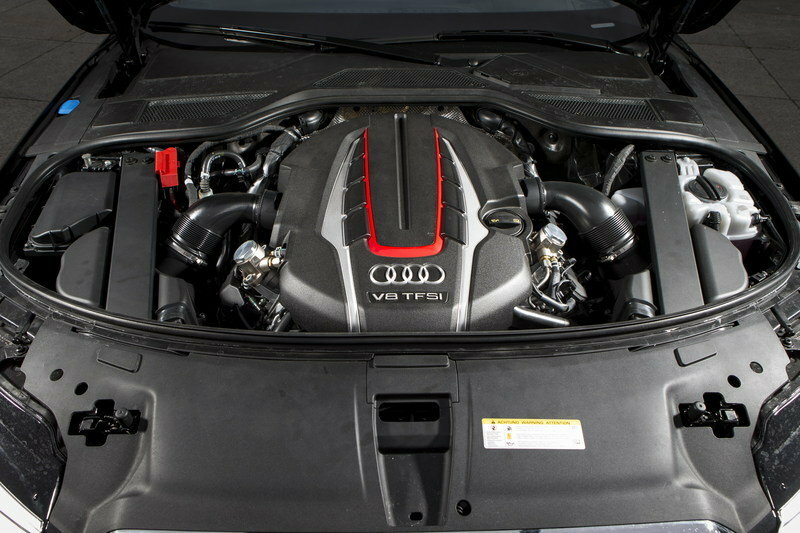 Click past the jump to read more about the 2014 Audi S8 by ABT Sportsline. Using its new power management system, ABT Sportsline managed to increase the output of the 4.0-liter, V-8 engine by no less than 120 horsepower and 96 pound-feet of torque. 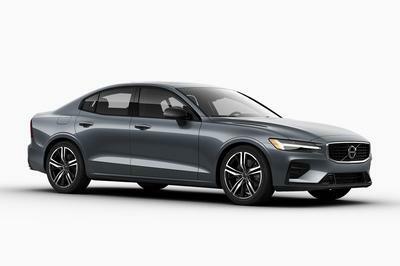 That means the sedan now benefits from a whooping 640 horsepower and 575 pound-feet, more than the R8 LMX, the most powerful Audi-badged sports car you can buy nowadays. To round things off, ABT also added a new muffler system made of stainless steel. 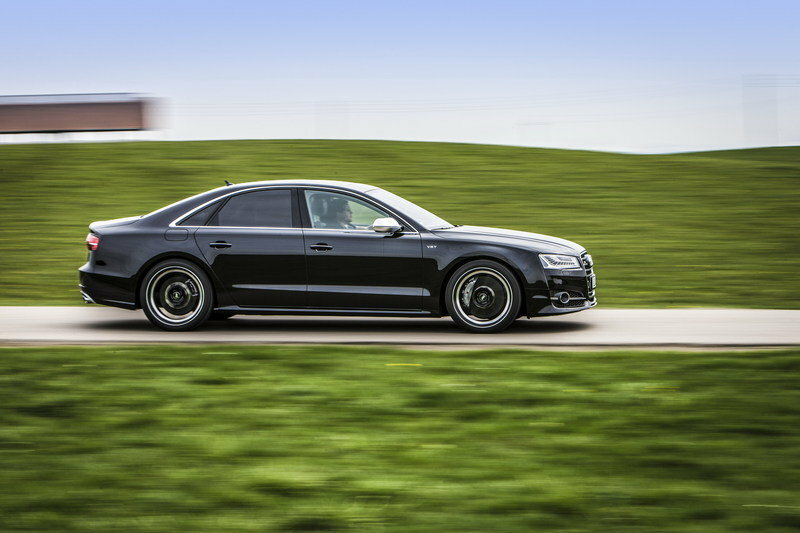 Dressed in a graceful shade of black, the S8 received the company’s 21-inch DR alloy wheels finished in Mystic Black for an overall darkened effect. However, the vehicle can also be fitted with the smaller, 20-inch ER-C wheels in either Silver Bullet or Gun Metal colors. Additionally, ABT can throw in the Level Control option that lowers the car by 25 mm (1 inch) at each axle. Bavarian King Ludwig II loved architectural extravaganzas, as you can tell by his fairytale castles. But if he were alive and drive a car he would certainly not only like Neuschwanstein but also the excellent “wagon maker” ABT Sportsline, the globally leading tuner of vehicles produced by the Volkswagen Group, which would be able to sell the King a newly tuned Audi S8, based on the latest facelift variant. ABT Power “New Generation“, the premium uprating with a separately developed control unit, ups this car’s performance from 520 hp/382 kW to 640 hp/471 kW, with the 4.0 TFSI’s torque increased from 650 to 780 Nm. With so many “horses”, Ludwig II would have been in Herrenchiemsee or any other of his castles in a jiffy, especially if you consider the new top speed of 280 km/h. And who would need fanfares if your ride were to be accompanied by the sound and looks of a four-pipe ABT muffler system made of stainless steel? The legendary fairytale king, by the way, didn’t only love music but was overall artistically inclined. The 21’’ ABT DR alloy wheels, so monumentally looking on the car in the photo, certainly would have impressed him with their contrasting colours of Mystic Black and a machine-relieved well. 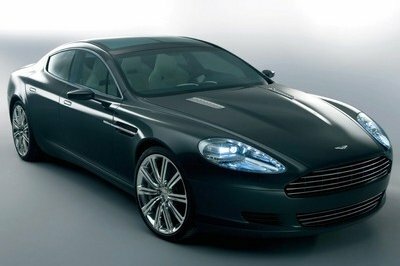 But His Majesty could also have chosen something smaller or, alternatively, the Gun-Metal finish. Or perhaps an entirely different design? 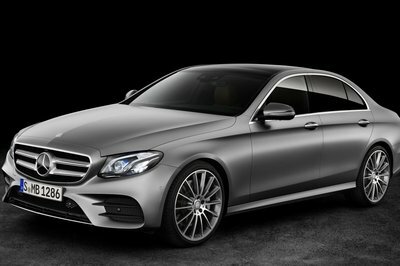 In which case, ABT would have 20’’ ER-C wheels – in silver-bulllet or Gun-Metal color. 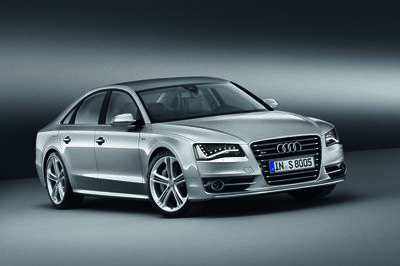 And you can lower this sporty Audi luxury car with the ABT Level Control; by 25mm each on both the front and rear axle.